… We can see that it bounced but then proceeded to break the black support line, which of course was a bearish event. … We are still on an RSI Daily sell signal, and next major support is around $36 which is also at the 0.5 Fib line. The Fib 0.382 line is next up, which could dampen the fall. All in all, I am in no rush to pick up more at this point in time. … As one can see in the long term chart above, buying Premier at around these levels have resulted in some good to great medium term results over the last ten years. I think Premier has a lot of growth in the future, and I can see it being one of the best performers in a gold bull, granted they do things right of course. 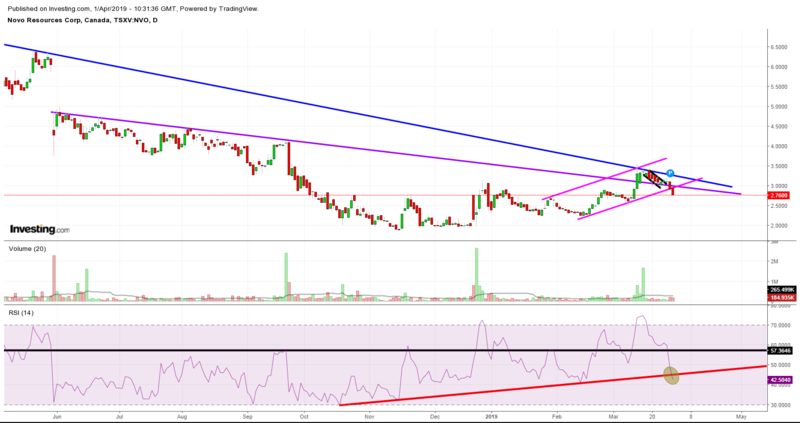 … As you can see, Novo broke down from the pink uptrend channel as well as fell below the purple support line (but not on really heavy volume thankfully). Not only that, but it just barely triggered a daily RSI sell signal. Now, given that we are expecting news early this week, the stock might of course reverse all this in a heart beat. There is also a lot of support levels below the current price. … As you can see in the chart above, Irving fell hard on Thursday and Friday along with Novo and Miramont. It sliced through the pink support line as well as the blue support line, on decent volume. It also producer a RSI Daily sell signal. There should however be quite some support in the current area. … I continue to hold a decent chunk of Miramont as I am currently unwilling to sell at these levels since doomsday seems to already be priced in. I might actually buy more if it falls even further since they got plenty of cash left coupled with the fact that they have only drilled six (soon to be nine) holes in that big diatreme. If/when their original flagship project “Lukkacha” is back on the table some day, the speculation cycle should restart again given the potential size of the price. I have a hard time believing that the big down days in Novo and Irving had anything to do with some fundamental change in the companies in question, but was connected to heavy cross ownership between Novo-Irving-Miramont. With that said, Thursday and Friday’s action did create some technical damage as described earlier in the article.